Kim Hollis: Finding Dory, the Pixar sequel to the beloved film Finding Nemo, had the highest opening weekend ever for an animated film at $135.1 million. How was Disney able to achieve such a terrific result? Jason Barney: When something like this happens usually there are a lot of contributing factors. Obviously, the most significant of the reasons for this massive opening is that fact we are looking at a good film/very popular franchise. I'd argue that Finding Nemo is an animated flick that almost every parent or older sibling talks about in a positive way. It achieved nearly classic status as far as kids films go. 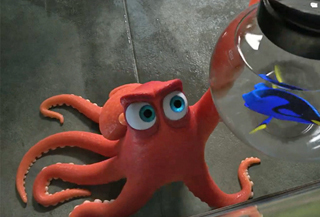 Now, Finding Dory appears to be nearly as good, which is saying A LOT. Another factor is that Finding Dory is actually a case of the much anticipated sequel. It is kinda hard to compare it with what happened to Jurassic World last year, but it certainly is similar. The newest installment is pretty much a beloved story. Jurassic World set huge records and now Finding Dory is doing the same. I think another factor was the timing. School is out, and most of the people who wanted to see Angry Birds already did. It has been out for five weeks. The other two kids flicks in theaters are Jungle Book and Zootopia, and both of them have been out for a long time. Families wanted something to do and Finding Dory became an option for a lot of people. Finally, I believe people were just looking for something better at the box office. The last few weeks have been awful, with Now You See Me 2, Warcraft, X-Men, Teenage Mutant Turtles 2, and Alice Through the Looking Glass all underperforming. With social media affecting movie sales so quickly, people jumped at the chance to see something good.